Danny Kost grew up in southern Indiana, and came to Alaska in 1984 on a vacation. 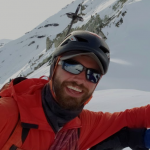 During that first trip to Alaska, Danny took a two-week guided glacier seminar on the Root and Kennicott Glaciers near McCarthy with Bob Jacobs, and fell in love with Alaska and Wrangell-St.Elias National Park. He returned the next year as an apprentice guide, and has been exploring the park ever since. In the years since, Danny has explored much of the park on many hiking and climbing adventures. 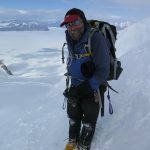 He considers himself lucky to have been able to make the first ascent of many peaks within the park including Mount Anderson, Mount Leeper, Mount Tittmann, Frederika Mountain, The Presidents Chair, Pyramid Peak, Needle Mountain, Hanagita Peak, and numerous unnamed peaks of over 11,000-feet in elevation. Although he has made ascents on some of the higher peaks within the park, he prefers the lower elevation peaks of 12,000-feet or less. Danny has also made first ascents of several ice climbs within the park. He considers Wrangell-St. Elias home and continues to explore new areas in this vast wilderness each year. In 2000, Danny finished the first edition of “Hiking in Wrangell-St. Elias National Park” and in 2004 the second edition was published. It is currently available through the online bookstore of the Alaska Natural History Association. He is now working on a climbing guide to the park, which is turning into another long-range project. Danny has also climbed and hiked in other parts of the United States, Canada, England, France, Italy, Scotland, Switzerland and Whales. He splits his time between Anchorage and his cabin in McCarthy.